Preheat your oven to 180. Wash the aubergine and pat dry with a towel. Slice the aubergine lengthways down the middle. 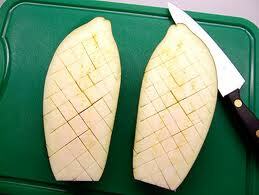 Next, take your knife and make deep criss cross incisions. 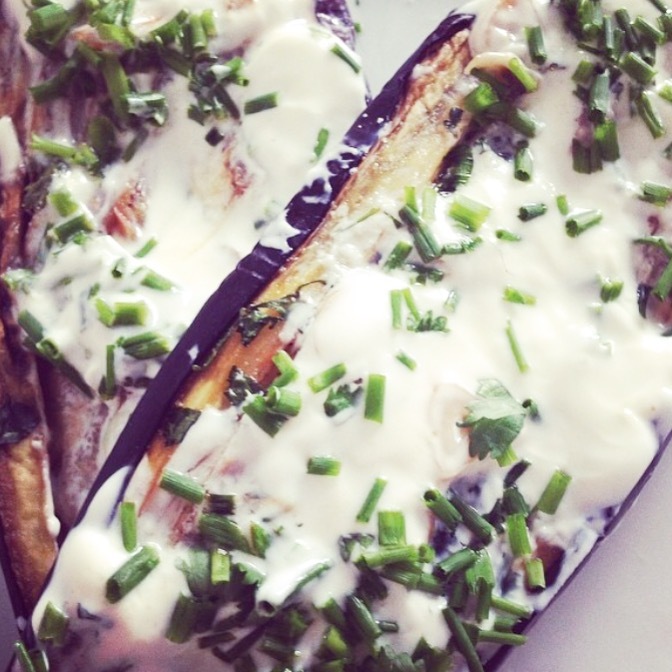 Brush the olive oil over the whole aubergine, both sides, then face them upwards on a baking tray and spread one crushed garlic clove on one half, and one on the other, then add salt and pepper. Bake for twenty minutes, then turn them over and bake for another twenty minutes. Turn over once more and bake for a further ten minutes. You want to make sure the inside is really soft. Once ready, add a dollop of Greek yoghurt on each half and sprinkle with chives.